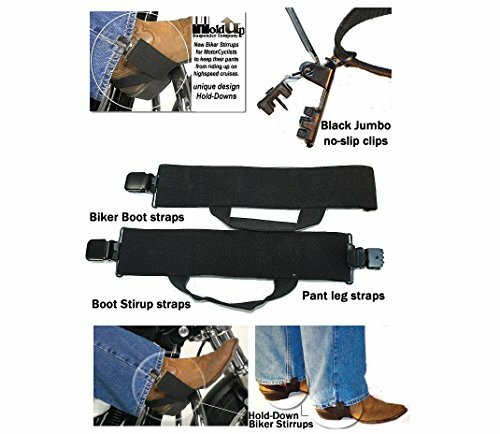 Hold-Down® biker stirrups are designed to keep pant-legs down while cruising. Easily adjustable for walking so stirrups don't drag. Featuring our patented no-slip® clips in black metal, guaranteed not to slip off. Unique design eliminates dragging the strap while walking. Biker boot Stirrups are used to keep the motorcyclists pant legs from riding up when using foot peg rests, while cruising at highway speeds. These boot straps are extremely useful and so simple to use you'll want several pair. Without a pair of Hold-Downs® your pants just ride up in the high winds, often causing a safety danger when leaning over to constantly pull them back down. Bikers are well aware of this and the risks of a high-speed spill when performing this chore so a pair of Hold-up® Boot straps are the cure to this common problem. The unique design of our Hold-Down® Biker Stirrups give the following benefits not found in other boot stirrup brands regardless of our low price. We guarantee these pant to boot stirrups will never pop-off your pants while riding or walking. 2" wide main durable elastic stirrup strap with 1" wide heel strap and 2 exclusive jumbo no-slip® clips. The heel strap firmly holds the stirrup in place between the heel and boot sole and prevents dragging while walking. Our no-slip® clip, in black finish, has a needle sharp center locking pin that will not fray your pants. Works with all pant materials from jeans to thin leathers. The uniquely design Hold-Downs® allows you to shorten the stirrup length for walking by simply sliding both clips down the stirrup loop 2" openings. The extra elastic fabric just slides up under the pant leg. All our products come with a 30 Day money back guarantee. If you have any questions about this product by Hold-Up Suspender Co., contact us by completing and submitting the form below. If you are looking for a specif part number, please include it with your message.